One word for SoupToys Toybox is "amusing." Another way to describe it is "something that'll eat up a lot of time if you're not careful, and that's a good thing." 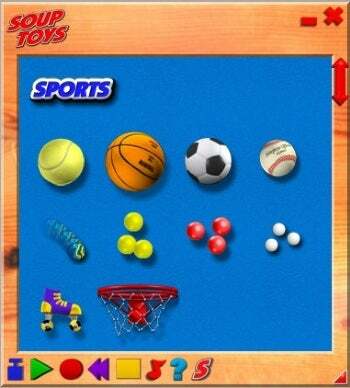 SoupToys Toybox (free) places a box full of basketballs, tennis balls, tiny rubber balls, a roller skate, a basketball hoop, and other objects, on your desktop. It gives these objects cartoony physics and lets you go nuts with them. It even keeps score when something manages to clear the basket. The roller skate, especially, is amusing because of how it gets knocked over when a basketball is tossed at it. Fill the screen with these SoupToys with little to no slowdown.